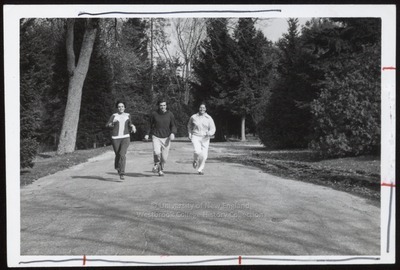 "Three Students Jogging, Westbrook College, 1970s"
Three Westbrook College students jog through Evergreen Cemetery in this 1970s candid black and white photograph. The three names listed on the back of the photo are: Kimberly Beaulieu, Steve Woodson and Sheila Colby. Kimberly and Sheila wear jogging suits with matching tops and bottoms; Steve wears a dark top and lighter jogging pants. Evergreen trees line the single lane road on which the three run.